Today in the store you can buy almost any costume for Christmas parties or theatrical productions. You can become a musketeer, puss in boots, a tiger and even a magic fairy, but not a crocodile. Equally frightening costumes why do not produce. But what about, for example, if your child is involved in the play based on tales by Korney Chukovsky? And there's just teeming with crocodiles. Make your own costume. Make a mask of a crocodile from a cardboard box. Take a box of oblong shape. It should be easy to dress on the child's head. Palate it from the inside with duct tape to hold the shape regardless of your manipulations. Cut the front wall, so that the child could see in front of him (i.e. the baby's face will be visible and the mask is worn like a cap). The sides of the boxes cut out teeth-teeth. Glue the mask with paper and paint in green. Pre-draw the eyes on the sides of the box and whiten teeth. Eyes can done another way. Cut from heavy paper a small oval, cut it in half, fold 1-1,5 cm and glue to the ACC from the top of the mask (location of eyes, like a frog). An even simpler option is making a mask of a crocodile. It is out of the ordinary caps and a sheet of paper or cardboard. Fold the sheet of paper, attach it to the visor of a cap. On both sides of the lower edge of the sheet cut out the teeth. His eyes affix on the frontal part of the cap. Paint the mask. If you are not satisfied with such a simple solution to the question, make a mask out of two cans. Take two plastic cans of mineral water with a handle. Cut it with a knife along. Cut the bottle with the lid from the canisters. 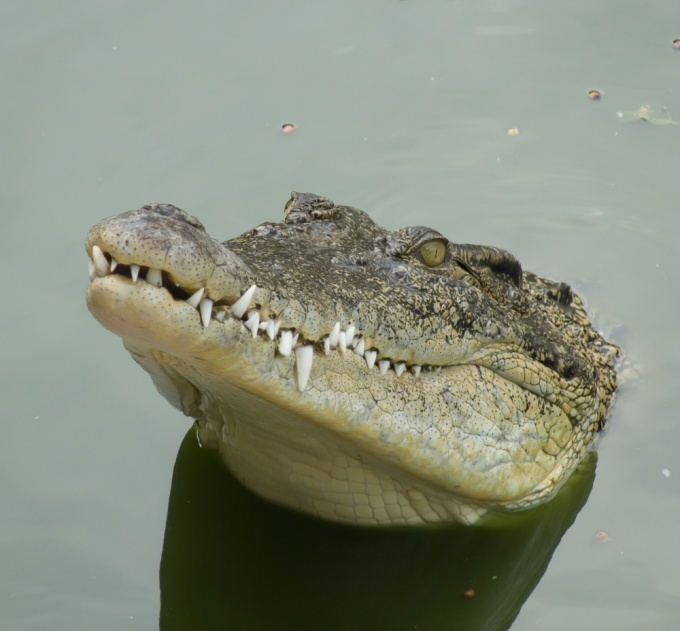 The longitudinal cuts with a scissors make the crocodile's teeth. From the cut off tops of caps make eyes. Glue them on top of the mask with glue "Moment". Then take PVA glue, mix it with acrylic paints or gouache and paint the product. Make punch holes in the corners of the jaws, seal the parts with wire or cord. Part of the mask that will be worn on the child's head, make out of cardboard. And another very important point: for the manufacture of the mask do not use cans of chemical reagents.Clothes easier – let it be green clothes, sew her tail and cardboard spikes. Harder to mask, but to produce it not as difficult as it seems at first glance.